Ed Henry reports on text messages obtained by Fox News that show Sen. Mark Warner attempted to arrange a meeting with the dossier author. FOX NEWS EXCLUSIVE – Sen. Mark Warner, the top Democrat on the Senate Intelligence Committee who has been leading a congressional investigation into President Trump's alleged ties to Russia, had extensive contact last year with a lobbyist for a Russian oligarch who was offering Warner access to former British spy and dossier author Christopher Steele, according to text messages obtained exclusively by Fox News. "We have so much to discuss u need to be careful but we can help our country," Warner texted the lobbyist, Adam Waldman, on March 22, 2017. "I'm in," Waldman, whose firm has ties to Hillary Clinton, texted back to Warner. Steele famously put together the anti-Trump dossier of unverified information that was used by FBI and Justice Department officials in October 2016 to get a warrant to conduct surveillance of former Trump adviser Carter Page. Despite the efforts, Steele has not agreed to an interview with the committee. Secrecy seemed very important to Warner as the conversation with Waldman heated up March 29, when the lobbyist revealed that Steele wanted a bipartisan letter from Warner and the committee’s chairman, North Carolina Republican Sen. Richard Burr, inviting him to talk to the Senate intelligence panel. Throughout the text exchanges, Warner seemed particularly intent on connecting directly with Steele without anyone else on the Senate Intelligence Committee being in the loop -- at least initially. In one text to the lobbyist, Warner wrote that he would "rather not have a paper trail" of his messages. An aide to Warner confirmed to Fox News that the text messages are authentic. The messages, which were obtained from a Republican source, are all marked "CONFIDENTIAL" and are not classified. They were turned over to the Senate panel by Waldman last September. Waldman, who did not return calls seeking comments, runs the Endeavor Group in Washington. Waldman is best known for signing a $40,000 monthly retainer in 2009 and 2010 to lobby the U.S. government on behalf of controversial Russian billionaire Oleg V. Deripaska. Deripraska had his visa revoked by the State Department in 2006 because of charges, which he has denied, that he has organized crime ties. They said the committee has been in possession of this material for several months and committee investigators have pursued all relevant investigative leads related to the material. "From the beginning of our investigation we have taken each step in a bipartisan way, and we intend to continue to do so," Warner and Burr said in the statement. "Leaks of incomplete information out of context by anyone, inside or outside our committee, are unacceptable." Sen. Marco Rubio, R-Fla., another member of the committee, tweeted Thursday night that Warner "fully disclosed this to the committee four months ago." He added that the disclosure "has had zero impact on our work." The conversation about Steele started on March 16, 2017, when Waldman texted, "Chris Steele asked me to call you." Warner responded, "Will call tomorrow be careful." The records show Warner and Waldman had trouble connecting by phone. On March 20, Warner pressed Waldman by text to get him access to Steele. "Can you talk tomorrow want to get with ur English friend," Warner texted. "I spoke to him yesterday," Waldman texted. The two men appear to have finally connected about Steele by phone on March 22, according to the records. "Hey just tried u again gotta give a speech but really want to finish our talk," Warner texted. Waldman, at one point, texted back that Steele really wanted a bi-partisan letter requesting his testimony first. He added that Steele was concerned about word leaking to the media that they were talking. In one text, Warner suggested he did not want Burr or any other senator included in the discussions: "Ok but I wud (sic) like to do prelim call u me and him no one else before letter just so we have to trail to start want to discuss scope first before letter no leaks." Waldman noted repeatedly that Steele was concerned about leaks and was "spooked" by all of the attention he had received around the world. Steele, he said, was skittish about talking to Warner. Warner texted back on March 30: "We want to do this right private in London don't want to send letter yet cuz if we can't get agreement wud rather not have paper trail." "Yes seems to have cold feet from the leaks. Said he wanted a bipartisan letter followed by written questions," texted Waldman, adding that the Wall Street Journal had contacted him asking if he was an intermediary between the panel and Steele. In the text messages, Warner also discussed the possibility of a trip to see Steele. On March 23, Warner texted, "Need to coordinate date for trip can u talk with my scheduler also want to discuss Paul," an apparent reference to former Trump campaign chairman Paul Manafort, whose initials are used in the next text by Waldman. On March 26, Warner texted, "Really need to set date things r going to really pick up." "Standying by to do it," texted Waldman. "Awaiting call from your scheduler and also the letter he (Steele) would like they(sic) we discussed. And have second interesting thing to raise. Pls call." But after calls back and forth, Warner made clear that he wanted to talk to Steele directly without Burr or anyone else being involved, even though Steele was insisting through Waldman that the contact start with a bipartisan letter inviting him to cooperate with the Senate panel. "Hey can't we do brief (off the record) call today before letter so I can frame letter," Warner texted Waldman on March 29. "Steele wants to have letter first. Or did you mean call w me?" Waldman texted back. Trump reacted to the findings in a tweet late Thursday, writing, "All tied into Crooked Hillary." Warner’s text messages were quietly given to the intelligence committee after he and Burr signed a joint request for the messages last June. 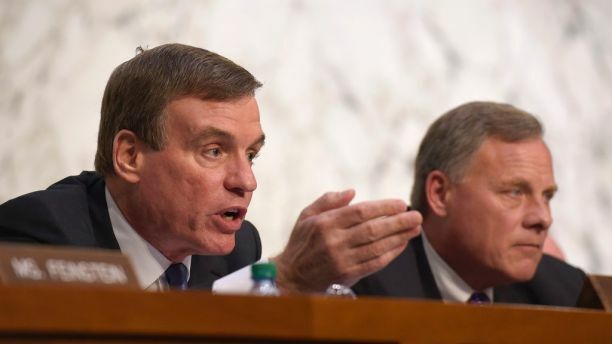 Warner and Burr privately informed the rest of the Democratic and Republican senators on the panel of Warner's text messages in a meeting last October. A Warner aide acknowledged that Warner and Burr revealed the texts to their colleagues on the panel because "they realized out of context it doesn't look great." But aides to Warner and Burr both stressed that the chairman was kept apprised of Warner's efforts. An aide to Burr knew there was a "back channel" Warner was using to try and get to Steele and was not concerned that Warner was freelancing on the matter. Over the course of four months between February and May 2017, Warner and Waldman also exchanged dozens of texts about possible testimony to the Senate Intelligence Committee from Deripaska, Waldman's primary Russian billionaire client. In January 2009, Harper's Magazine reported that Deripaska had hired an advisory firm with close ties to Hillary Clinton to help him get a visa to enter the United States." The magazine quoted Waldman as saying his firm does not lobby, though he filed paperwork with the Justice Department to represent Deripaska before the U.S. government. In the dozens of text messages between February 2017 and May 2017, Waldman also talked to Warner about getting Deripraska to cooperate with the intelligence committee. There have been reports that Deripraksa, who has sued Manafort over a failed business deal, has information to share about the former Trump aide. In May 2017, the Senate and House intelligence committees decided not to give Deripraska legal immunity in exchange for testimony to the panels. The text messages between Warner and Waldman appeared to stop that month. Ed Henry currently serves as FOX News Channel’s (FNC) chief national correspondent. He joined the network in June 2011.